Discussion in 'MacBook Pro' started by oiuh151, Jun 15, 2012. If you look at Anandtech's photo gallery of the New MacBook Pro resolution options you can see that their 1920x1200 workspace photo is actually 3840x2400. Which means that there will no degraded quality if you choose one of these larger workspaces to choose from like you'd see on a typical monitor. I really suggest you view these screens in person to see how there's no degradation in quality based on what scaling you choose like on typical monitors. Further proof of this is evident in the app SwitchResX as pointed out by a user on this forum. There is an option for 3360x2100 and it's not faking anything. I think its already been proven that the display is 2880x1800. Its basicing a x4 scaling hack to inrease the amount of workspace. They only wanted to double horiz/vertical (quadruple) already standard resolutions for desktop real-estate sizes and wanted to allow up to 1920x1200 in physical size. This meant 3840x2400 mode which is then downscaled to 2880x1800. Adds more strain on video memory/video card and sub-pixel font rendering will likely not be as effective. Honestly this is not a very good method IMHO. 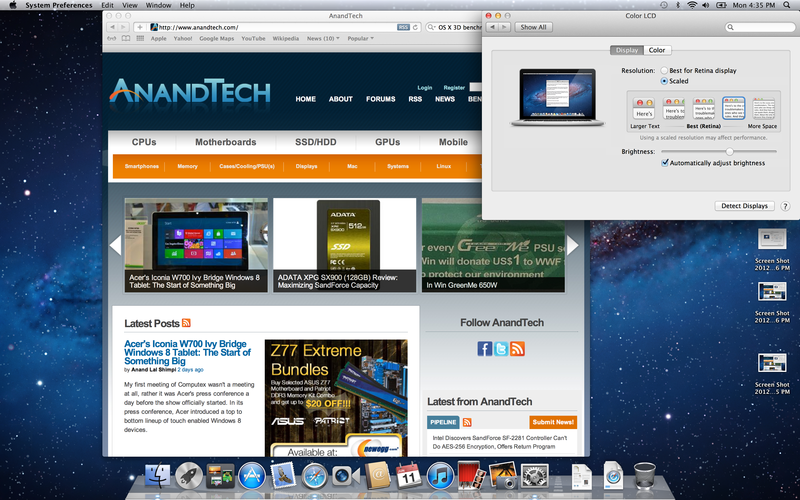 The LCD in the macbook pro is not capable of 3840x2400. If it was downscaled back down to 2880x1800 then the direct image from the desktop should not be that large, nor should SwitchResX show the resolution as an option. Except the GPU is downscaling AFTER the framebuffer, where you're taking your screenshot. The screen is 2880x1800. The end. I did this myself with switchresx. I think I agree that this screen res is scaled, but also I think the actual nit is so high that its a semi true resolution. I saw someone post in another thread that the 2880x1800 res wasn't 100% true due to the actual pixel density and the explanation made sense...I just can't find the thing. Its possibly a mix between the two. Everything looks sharp but...aside from the giggle factor...this res is retardedly unusable. I had to put my face right up on the screen to read anything. Jeez, you people must have an eye of a hawk. First of all, retina doesn't seem like that big of a deal to me to start with, but even if it was, I couldn't use it because of how tiny everything that isn't supported would look. 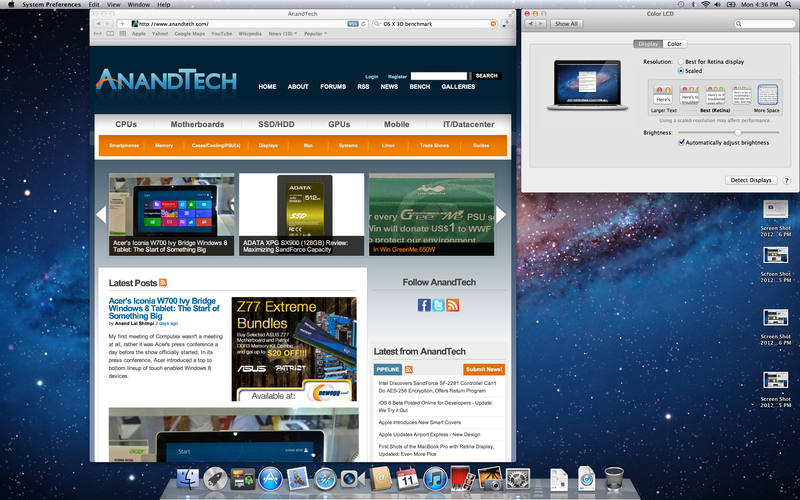 It looks like Apple has come with the most convoluted method of using a high DPI display but the result is incredible. Retina mode looked better than anything I've ever seen, then I tried 1920 wide mode and expected it to look scaled, it did not. I even put some HD test images up and they looked like they were being displayed on a native HD monitor. The hardware/software needs to catch up to cure the lag but after seeing that display I'd have a hard time accepting anything else. I agree that's extreme 'honey I shrunk the desktop'!